The RB-BL4 Dual Stereo Bi-Directional Matching Converter. The RB-BL4 is a dual bi-directional stereo unit for interfacing domestic or semi-pro unbalanced equipment to professional balanced line levels, and vice versa. The four XLR-3 electronically balanced inputs have an impedance of 20kΩ bridging and are routed to four unbalanced RCA (phono) outputs with an output impedance of <50Ω. The four RCA unbalanced inputs have an impedance of 20kΩ and are routed to four balanced XLR-3 outputs with an output impedance of <50Ω. All connections are on the rear panel. 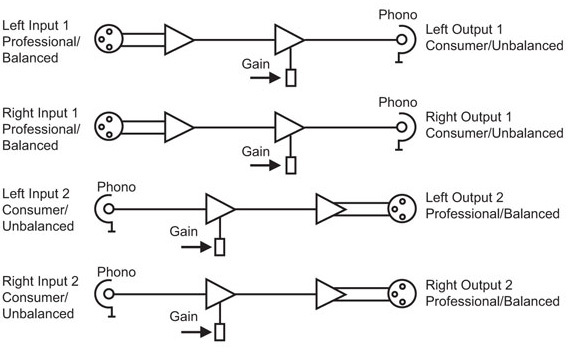 The output gain can be adjusted for left and right channels by using pre-set potentiometers accessible through the rear panel.